I have been working on a multithreaded application and I have been running it on my desktop machine as I am building it out. Everything seems to be running smoothly so I decide that it is time to move it over to my dual quad core zeon box to see how well it will do in that scenario. At this point I am just gathering metrics. I create the installer and install it on the box and as soon as I runn the app I get the following error “BadImageFormat Exception”. Not quite sure whats going on, I surmised that it had something to do with the fact that my desktop is x86 and my servers are x64, Now I know I compiled it using “Any CPU”. Should work I would think. Well I was wrong. In order for it to run on the x64 box, I needed to actually compile it using “x86” cpu selection.The issue was not so much the app itself as it was the 3rd party dll that I had referenced. If I removed it then all went well to a point (no work was really done). So if you run into this issue try out this solution and see if it helps. This months TFS Times newsletter is going to focus on TeamBuild in VSTS 2008. As I was putting it together, I decided that I would write I nice post on a step by step walk through of a new BuildDefinition. So here goes. 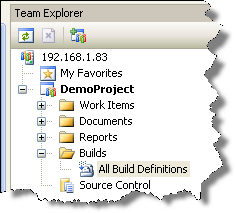 The first thing you will notice is that the name has been changed from Build Types to Build Definition. You want to select that option. 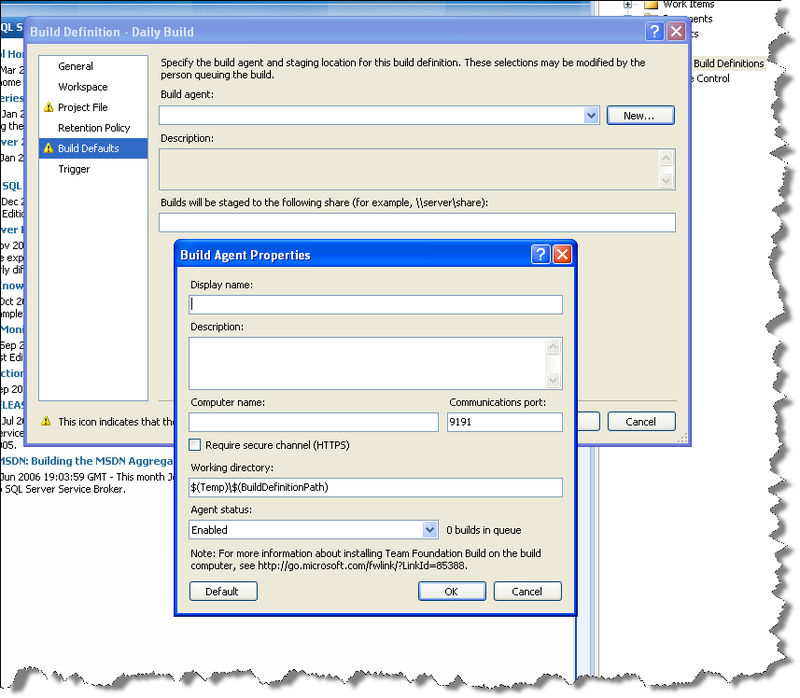 You will notice that the Build Definition Wizard has changed considerably in VSTS 2008. On the left side are the steps that you will complete. Rather than this being a true wizard where you select “Next”, you actually will click on the left side items. This will allow you to bounce around the definition setup. You will also notice the yellow triangles. These denote items that need to be completed. 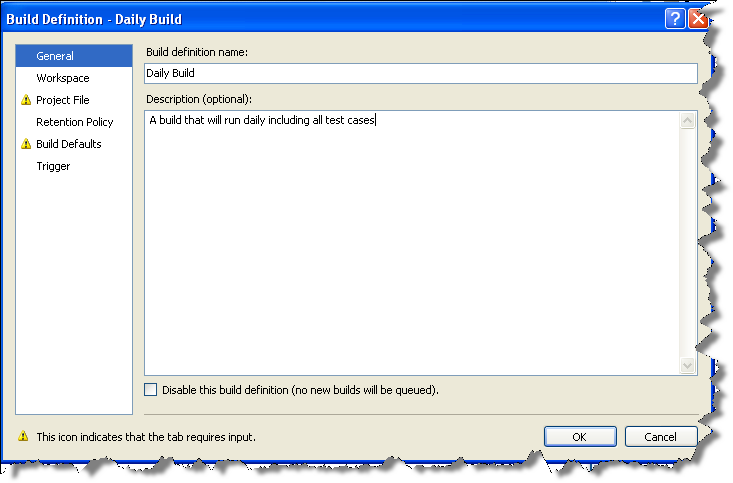 On this step you will give the Build Definition a neame and optionally a description. Another neat feature is the checkbox that allows you to disable the build definition. This is nice if I decide that I do not want the build available due to incompleteness of the setup, or in cases where it has been deprecated, but you do not necessarily want to delete it. The next item in the list is Workspace. This replaces the need to have to customize the workspacemappings.xml file in vsts2005. If you recall (or maybe not), that in VSTS2005 the build server would pull down all the files in a project unless you defined the exact location of the code files you wanted to build. This would sometimes cause the build to run way to long. For example the build machine might pull down 10 mb of files to run a build on a 2 mb solution. This new step eliminates the need for the workspacemappings file and gives you a nice UI to setup the the location of the files you want to build. The next step is required. 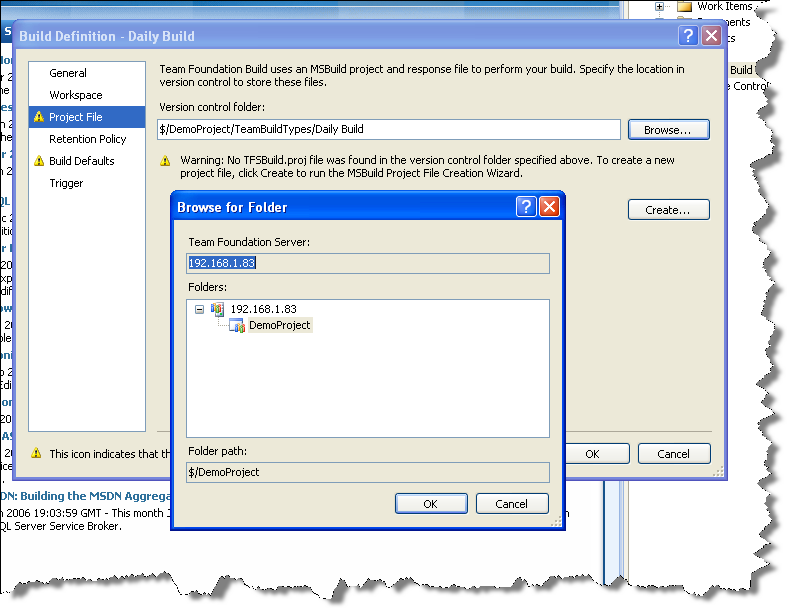 It allows you to decide where to put the Build Project file that gets created. Again, if you recall in VSTS 2005 you had to accept default location of the builds project files. This was not always an ideal solution and so in VSTS 2008 the team decided to allow the users to place the build project files where they wanted to. As if it can’t get any better, we now have a retention policy. This is awesome!! I have the ability to decide how long to keep builds around for. For example you may want to keep all failed builds around until the team has had a chance to review the failure. You will also notice the new “Partially Succeeded” build outcome. This is a neat feature that I really like. The usual scenario for this outcome would be when the tests failed, but the build compiled correctly. 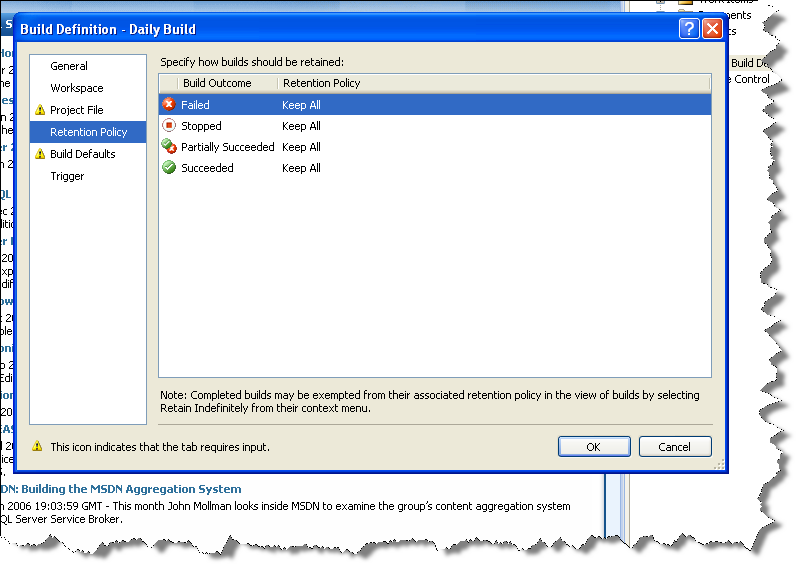 The required next step is to define the build agent (build machine) that will actually run the build. You have the choice of giving the agent a friendly name (as opposed to some obscure machine name) so that you can easily distinguish it from other agent you may have. The computer name is the name of the build machine. Refer to build docs for the maening of all the items on this screen. Most folks just need to define the build machine name and a drop location for the binaries. Lastly we have the ability to schedule the builds. This is a fantasic feature that I have been waiting for. 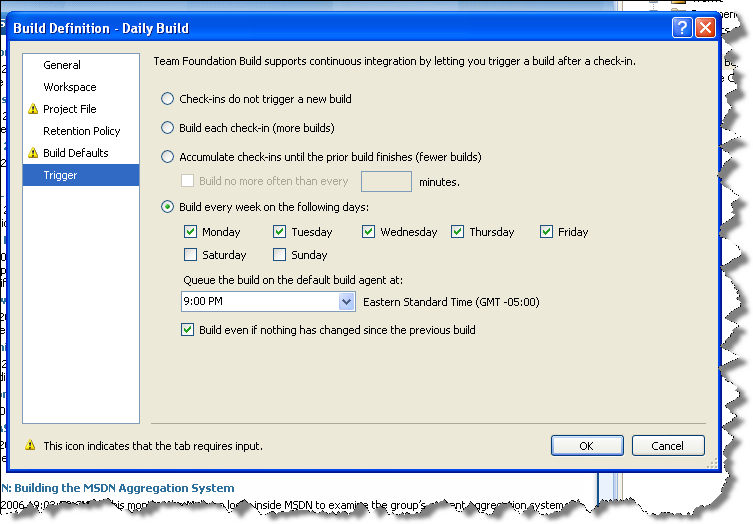 No more having to create custom solutions or Scheduled Tasks on the build sevrer. This is the mechanism for setting up Continuos Integration as well as anyother schedule you like. As you can see I am going to run a build every weekday at 9:00 PM no matter if there were changes or not. To sum it up, the build functionality in VSTS 2008 contains some of the best new features. Please take the oportunity to check out the latest edition of the TFS Times newsletter for more cool features and insights into TeamBuiild. Well its about to begin. Never have been up here at the Chicago meeting, I must say I am impressed by the turn out. Its a constant steam of folks coming in and the best thing is that some are actually bringing gifts for the Toys for Tots drive. I am hoping to jump up and get a chance at open mic to talk about unit tests. That is one of the coolest features in VS 2008 Pro. I mean there are a bunch of new things in there, but I think the unit testing being moved to all skus is great because i think it will help devs design better software. Well more later as the evnt gets underway. Hot off the presses is the December issue of TFS Times. Check it out and while you are at it, subscribe. Ever since Microsoft took ownership of the Web Access tool I have always look forward to each release as it comes down the pipe. I am anticipating this release since it has some great new features. Brian Harry has a great post on all the cool new features in the latest release. I especially like the linkable web pages and the support for custom controls. Download this great FREE tool. In case that you have not had enough with the latest release of VSTS 2008, along comes Rosario. The team is working extra hard and I wonder when they actually take time for themselves. On one hand I think this is awesome that I can play with. At the same time I am still trying to get comfortable with the latest VSTS 2008 RTM. I guess I just need to find a way to to add an extra day to the week and I will be fine. Maybe I can extend TFS to help me out with that:-). About 2 months ago I was leading a meeting at the Indy TFS SIG when I was asked about all the resouces out there on VSTS and TFS. What I found was that there are a lot of people that do NOT read blogs voraciously, do NOT realize the MSDN forums are a great place to get answers and had NOT heard of the Teamsystemrocks.com site. These folks are just average IT workers that go home and spend their evenings watching TV, hanging out with the family, or do other constructive activities. It was then that I realized that most IT people are not as driven by the same things that I am, but still hunger for quality information that they can use during their day to day activities around VSTS and TFS. This has led me to start a newsletter focused on VSTS and TFS called the TFS Times. You may say well that is just rehashing all the same stuff that is out there already, or what’s wrong with just going to teamsystemrocks. Well like I said, there are people that have not heard about a lot of these sites, or just do not know how to decipher all the info that is out there. Case in point, try finding all the good content on MSDN. I can even get overwelhmed! I hope that you will take the time out to visit the site as well as sign up. I will publish a monthly newsletter. Not changing it all the time, just once a month. The goal is to pick a topic then gather all the good relevent info from around the web on that topic and stuff it in a news letter for you to enjoy. The first issue was short, but the response so far has been great and I have folks signing up everyday. I would hope to top 100 subscribers by the end of the year and try to get to 1000 by this time next year. Maybe I am expecting too much, but I think its doable. If I hit that 1000 mark, I want to publish it in a hard copy just like any other magazine. I hope to provide you the only VSTS/TFS focused periodical with the higest quality info. It will only continue to get better over time as we flesh out a good layout and add much more content. Speaking of content, i am always looking for folks to contribute and get their 15 minutes of fame. There is no way that I can shoulder the whole thing all the time, but I will do my hardest to try and make sure it is packed full of good info. In the mean time go and enjoy. I know I am really late to the table with this, but but late than never.